This is the official blog for psychedelic folk/synth-pop/incidental merchants Keshco, tended by Andy, a gentle chap who resides in London. 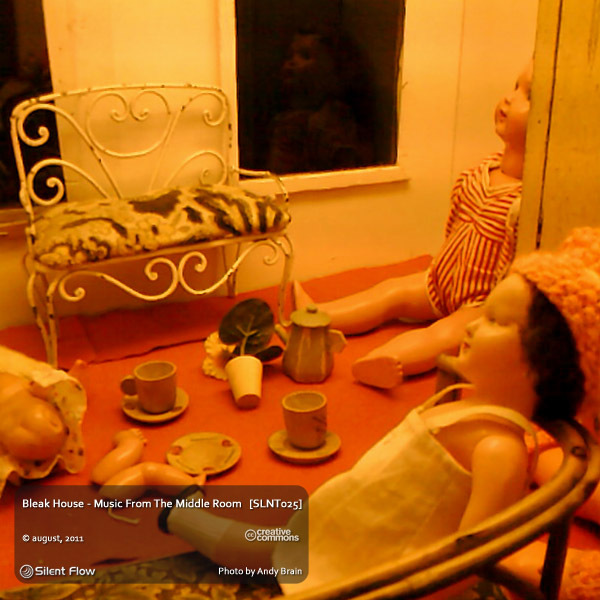 A new album of library music has just been released by Bleak House. So, who or what is Bleak House, and just what does it have to do with Keshco? Well, it may bemuse you to learn that we have two bands on the go. Bleak House is an alter-ego; in fact, one of many (not to clutter this post with the history of, say, Guivarsh) and probably the longest, having begun gestation in the market city of Leicester, England, back in 2001, with a note attached to a student union messageboard. At first, Bleak House was the folk-rock sister of Keshco, with a catalogue of jaunty kitchen sink pop tunes and occasional sci-fi/thriller narratives. Then life happened, in its unassuming way, and the House went quiet, just another name in the tattered old band directory. In 2004 we, that is Andy (your blogger) and Luke, started a tradition of yearly recording holidays down in Exmouth, where Luke's mum keeps a whole arsenal of musical instruments. There's an upright piano, a stash of various recorders, thumb-pianos, a Casio keyboard, some percussion, and we had our guitars. The recordings we made were mostly pretty instrumentals, fairly sparse and sometimes quite haunting. Of course we did nothing with these - what did you expect? Instead the years rolled past, and increasingly we went out in our other guise of Keshco. These yearly recordings continued though, until we had quite an embarrassment of moody incidentals. This album, "Music From The Middle Room", is divided into two suites for ease of listening, each roughly half an hour long. The first, "Through The Witch Window", opens with an 11 minute number called "Highway Acrylic", where Luke's electric guitar figure morphs glacially against my pitter-patter piano, and some extra acoustic guitar. It's a deliberately ponderous start, with a good 30 seconds of room ambience, to bring you into the right frame of mind for listening. Slow down, and take some time out. Our second track is the autumnal "Barometer", with a mantra-like guitar around which several chordal possibilities are hung. You'll just make out some wobbly crackly tones from the Yamaha VSS-200 voice keyboard. Some of these tunes benefited from being rerouted through Jeskola's Buzz tracker, the first of which is "Oil Burner". It's also the first track to feature Robert's drums, here tubthumping against our clanging guitars until a gas cloud of reverb boils up, swamping the listener in a dreamy steamy fug for a good three minutes. Track four is the wonky "Insect Trap", all a chattering and clattering tangle. It leads us to "Skirting Boards", a simple, almost Neu!-like sunrise melody on Luke's guitar confirmed by deep piano notes and occasional twinkles, to which a dexterous stereo stampede of toms has been added. Five minutes of this give way to an ascending spiral of harmonics, like dust motes rising in fresh sunlight. The side ends with "Antiseptic", a sound collage from the end of a 4-track that owes some extra thanks to Goldwave, the freeware audio editor. The second suite is titled "Behind The Cellar Door" and it opens (after your moment of grace; you did pause for an ear-stretch didn't you?) with a guitarless piece, "Coloured Lead Crayons". The electronic tones and arpeggios of the VSS-200 share centre stage with the aching piano and a gently delayed Casio keyboard. Behind the first few minutes you will note some humans approximating a choir. This was one of the recent additions, with I think five Roberts and five Andys improvising to their heart's content. Next we hear Luke's tumbling delayed guitar figure of "Biology Slides", glitchy and scratchy, against my simple piano melody. Probably the most intense track on the album, building to a teasingly-warped coda. "Praise Book" is almost as open, simple and timeless as it sounds. Then, somehow, we take you a few years forward; Luke's organ meditation "Everything Is Broken, Or Intact" comes from the Autumn 2010 session, and for me conjures up a Twin Peaks air of unspoken menace. What exactly happened here last night? Another question: What have those darn children been up to all this time? Well, I can't say, as there are no children in the Bleak House. But there is something moving in the "Toy Cupboard". This rather jolly piece was saved by Robert and a lapful of tiny instruments - two xylophones, a harmonica, pitch pipes, a thumb-piano. Soothing sounds for adults? Before you can escape the cellar, you have to shake hands with the tactile epiphany of "Coloured Lead Fingers". Luke's keyboard part holds steady whilst my piano plays across and around the rhythm, and Robert's violin adds a frisson of expectation. And there you have it. Twelve tracks from the dusty heart of the Bleak House, laid out for your relaxation and enjoyment. Any film-makers in search of backing tracks for documentaries, dramas or deconstructivisms, please do get in touch.